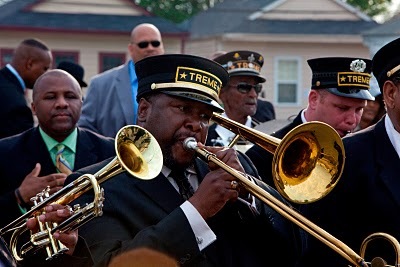 “Treme”: Won’t bow. | Phil-zine! Melding art, entertainment and my life in an attempt to find a question to answer. And out of the darkest night golden plumes dance down the street towards the camera; like a Phoenix rising out of the ashes and mud and destruction of New Orleans. “Won’t bow! Don’t know how!” this man, this Chief proclaims. And chills ran down my spine. Already Treme, the new HBO series created by Producer and Writer David Simon (the creator of one of the greatest television series of all time, The Wire) and Eric Overmeyer (who’s worked with Simon on The Wire, and Homicide — a show which I will now have to watch), has distinguished itself from every other show on television, ever. Characters’ dialogue already feels like they’ve been around for 5 seasons. Imagery that will already be considered iconic.Director Shawn Levy (a director I may just start liking) said in an article in LA Weekly recently that movies that take place in a constrained time span; an evening, or a night or day create a sort of fairy tale or fable. The first episode of Treme, which is one of the oldest neighborhoods in New Orleans, one of the first areas for free people of color and remains an important center for African American and Creole culture, especially the modern brass band tradition (thank you Wikipedia), creates a fable, a mythology so rooted it’s difficult not to feel the breadth and distinction of this amazing culture. Three Months After: the first title card reads. The first image is an out of focus reed for a clarinet or saxophone (I’m not sure which), next sounds of instruments tuning and warming up, then the people; streets are full of energy and life as one of these brass bands marches down the hurricane swept streets. The first time they marched since the storm, Katrina. These people are fighting; fighting by living, by keeping tradition alive. As the music settles and quiet falls, we begin to see the ghosts that have been left behind. Mud left caked on the floors of peoples destroyed homes, photos of stadiums of missing, a man made catastrophe a person calls the devastation. We don’t just see it because the cameras want us to, we see it through the eyes of the people who are grounded here. This show is about man made hope. About pride. And I’m with it til the end. There are familiar faces from The Wire, Wendell Pierce plays a trombone player never able to cover the cab fares he rings up and Clark Peters, a father returning to the devastation of home to live in a bar that isn’t his. It also includes nation treasure John Goodman and the always welcome Steve Zahn, plus Melissa Leo a wonderful actress that’s worth discovering…as this show is. This entry was posted on April 12, 2010 at 7:48 am and is filed under Uncategorized. You can follow any responses to this entry through the RSS 2.0 feed. You can leave a response, or trackback from your own site. I haven’t started watching it yet, as we have so little time, but I’m really excited about it. Right now we devote about an hour to TV a week, and LOST is filling that spot. Part of the reason I haven’t started is perhaps because I got to watch 4 seasons of The Wire on DVD, without waiting in between each, and with things so hectic, I want some instant gratification. It’s wavering a bit in general. Some things are starting to annoy me. I may have to post again.